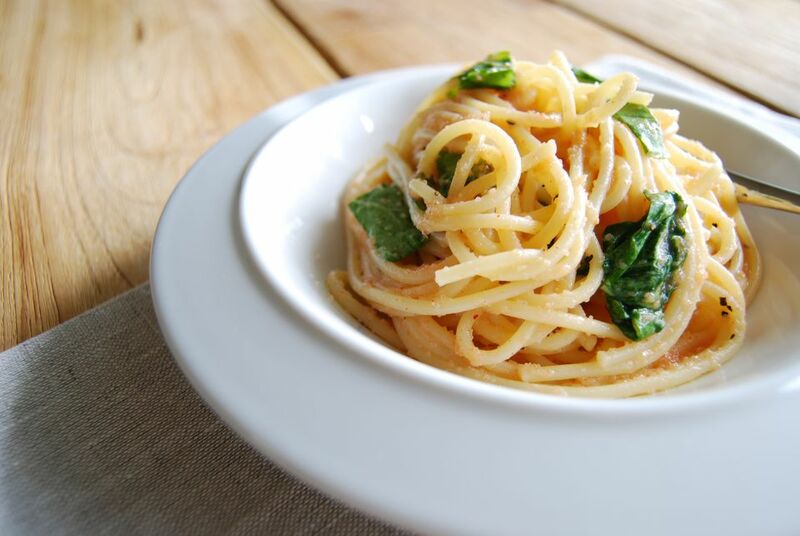 Karashi mentaiko and baby spinach spaghetti is a very simple recipe that can be whipped up in less than 20 minutes for a quick meal. It combines sautéed onions, spinach, and Japanese spicy cod roe, or karashi mentaiko, with spaghetti noodles. Boil spaghetti noodles for 8 minutes or until al dente. Drain and set aside. Remove the thin membrane of the mentaiko sac and discard. Set aside the eggs only. In a large pan, heat olive oil over medium-high heat. Add butter to melt. Add chopped onion and sauté until translucent. Reduce heat to medium. Add cooked pasta to the pan and coat with olive oil, butter, and onions. Add baby spinach leaves and toss until just barely wilted. Add a dash of white pepper. Remove pan from heat. Mix in raw mentaiko until the spaghetti noodles are evenly coated with cod roe. If you prefer the cod roe well done, simply mix it in with the pasta over medium-heat and cook it until the roe turns a pale pink, indicating that it is cooked through. Japanese style pasta such as this one is known as wafu pasta and differs from traditional Italian pasta primarily due to the type of Japanese ingredients used and the combinations of these ingredients. One of the most common Japanese wafu pasta dishes is mentaiko spaghetti. It’s very easy to prepare because it has few ingredients and the cod roe may be served either raw or fully cooked, or somewhere in between. It’s really up to personal preference. The cod roe is prepared by removing the tiny roe from the membrane or the thin exterior sac, and then the roe is either mixed with the pasta off the heat, for a creamier texture, or the roe is fully cooked and sautéed with the pasta. Try it both ways and see which you prefer. Karashi mentaiko may also be substituted with tarako or mentaiko. The addition of butter to this recipe creates a rich dish, and as such, this dish is sometimes better served as a small pasta dish in a multi-course meal, or as an appetizer. Optionally, the butter may be omitted completely for a lighter option.